Add a touch of feminine glamour to your look with this chic design. A longer version of the popular Foxi necklace, the Foxtrot design consists of three coloured wooden beads in metal squares suspended from a 44cm nickel-free metal choker. Delicate and eye-catching, it is the perfect item of jewellery for work or more formal occasions and looks great with cowl or V-necked tops and dresses. At under £20, this gorgeous feminine design is good value and currently available in three colours - understated black, cool prussian blue and bright apple green.Team it up with a pair of Foxi earrings to complete your look. 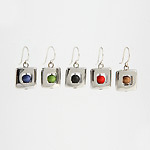 These elegant earrings come in three colours - red, prussian blue and green. 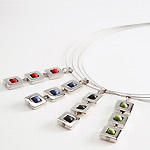 Choose a matching colour to go with your Foxtrot necklace or a complementary colour to make a statement.